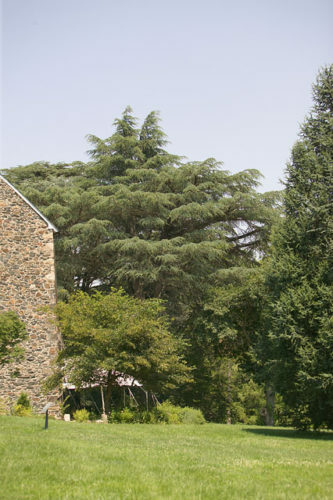 Cedrus atlantica, as described in 1855 by (Stephan Friedrich Ladislaus Endlicher) G.Manetti ex Élie-Abel Carrière (1818–1896), in Traité Général des Conifères is commonly known as Atlas cedar. It is synonymous with C. libani var. atlantica. Most botanists feel that this species is too far removed geographically from the natural range of C libani to warrant classification is a subspecies. Description. Atlas cedar is an evergreen coniferous tree which will grow to a mature height of 125 feet (40 m) high with a trunk of to 6 feet (2 m) in diameter at breast height, with an open, pyramidal crown. Bark on old trees is fissured. Branches are sparse, strongly ascending and relatively short. The tree's leading shoot is erect and bent at the tip. Leaves are silvery bluish or green in color, usually not longer than 1 inch (2.5 cm), growing in whorls of 19 to 28 individual needles. 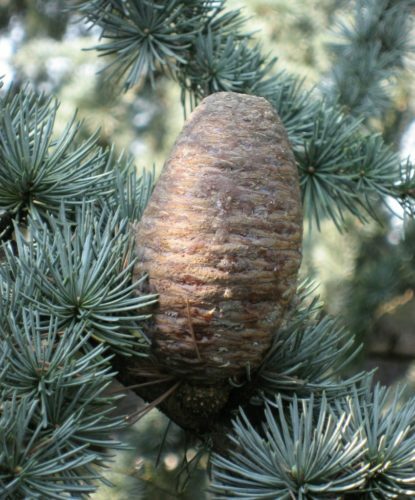 Seed cones appear from June to September. They are cylindrical, with a level or concave top, individually measuring 2 to 2.8 inches (5 - 7 cm) long, up to 1.6 inches (4 cm) wide, with glossy, light brown color. Cones mature in September and October, disintegrating and shedding seeds into the spring. Seeds are 0.48 inch (12 mm) long with a 0.48 to 0.6 inch (12 - 15 mm) long wing. Distribution. This species is native to Morocco and Algeria — the Atlas and Riff Mountains, growing at elevations of 3,200 to 6,500 feet (1,000 - 2,000 m) above sea level, where it forms monospecific stands. Attribution from: Mirko Vidakovic; Conifers: morphology and variation. Translated from Croatian by Maja Soljan; ©1991, Graficki Zavod Hrvatske, Croatia. Cedrus atlantica Green Industry Images Copyrighted Photo; Donated by Ernie Wiegand. Cedrus atlantica — a closeup of foliage and seed cone, at in Arboretum de la Vallée-aux-Loups.